Candice Pike is a dance maker-researcher-teacher whose work is rooted in building community and encouraging empathy. Her physical performances are devised by responding to photographs, heartbeats, poetry and inherited objects to create work based on the subtleties and stories contained in intergenerational (genetic) memory. In recent years she has used her multi-disciplinary approach to create and dance in several full-length works which in 2016 included two site-specific community and artist collaborations – Love and Adaptation at the Corner Brook Museum and Uncaught at the public library. Candice has also developed a series of site-specific, improvised, durational pieces presented at events such as Lumière Cape Breton and the Festival of New Dance – St. John’s. Throughout 2016 she also presented her duet, couerPulse throughout Atlantic Canada and in 2017 toured her solo Were You a Poem to four cities. 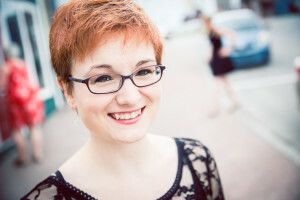 Candice has facilitated classes and workshops using her unique approach to movement, improvisation, and creativity education through such groups as Memorial University, Dance Studio West, Kinetic Studio, Learning Through the Arts, the NLAC Visiting Artist Program, ArtSmarts, Gros Morne Summer Music, and community recreation groups. She is currently working with the BFA Theatre program at Grenfell Campus to develop and facilitate introductory dance courses. Candice is the 2016 recipient of Corner Brook ACE Awards Artist of the Year. She was the 2014 winner of the Roberta Thomas Legacy Award from Neighbourhood Dance Works and was part of the team that won Arts Event of the Year at the Corner Brook ACE Awards in 2014 for her choreography and performance in Aberdeen and the Old Boot. She was shortlisted for the NLAC CBC Emerging Artist of the Year in 2014. She is the current president of DanceNL and sits on the National Council of the Canadian Dance Assembly.